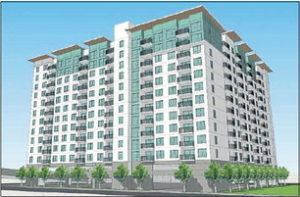 SAN JOSE » Hundreds of apartments are poised to sprout in downtown San Jose now that a property sale and key financing are in place for a project to bring affordable housing to a site near the Diridon train station. The McEvoy Apartments project, proposed for the corner of West San Carlos and McEvoy streets, would create 319 affordable residential units in a two-stage development, according to the developer and the financer for the residential complex. First Community Housing, acting through an affiliate called McEvoy Street, paid $13.5 million on July 31 for several parcels where the seller, 699 West San Carlos Street, now operates a metal shop, S& S Welding, according to Santa Clara County property records. At the same time as the property purchase, the First Community Housing affiliate obtained $15.8 million in financing from Housing Trust Silicon Valley, public records show. The lender provided $9.4 million to finance the purchase, and another $6.4 million for pre-development costs. The financing didn’t indicate funding for any construction at this point. The maximum rental range for the apartments will be $700 to $1,400 for a studio; $750 to $1,500 for a one-bedroom; $900 to $1,800 for a two-bedroom; and $1,050 and $2,100 for a three-bedroom — far below market rates. According to July 2018 McEvoy figures from RentCafe, the average rent in San Jose is $1,948 for a studio, $2,363 for a one bedroom, $2,878 for a two bedroom and $3,407 for a three bedroom. Compared with current market rate prices, asking prices at the new project would be 46 percent lower for the affordable studios, 52 percent lower for the one-bedroom units, 53 percent lower for two-bedroom apartments and 54 percent lower for three-bedroom residences. The first phase of building would provide a mix of one-, two- and threebedroom rental apartments, while the second phase would consist primarily of studios, according to Housing Trust Silicon Valley. More of these developments could materialize in this part of downtown San Jose, said Bob Staedler, principal executive with Silicon Valley Synergy, a land use and planning consultancy. Google is planning a mixed-use, transit-oriented community of offices, homes, shops, restaurants and open spaces where 15,000 to 20,000 of the search giant’s employees would work near the Diridon transit station and SAP Center. A short distance away, San Josebased Adobe Systems plans to dramatically expand its existing threebuilding headquarters campus by constructing an iconic fourth office tower at an adjacent property. “This location is absolutely what drove First Community Housing to do this deal,” Borelli said. Contact George Avalos at 408-8595167. The planned 14-story, 319-unit residential tower is located in downtown San Jose at the corner of McEvoy and West San Carlos streets. Developers will replace the welding shop currently at the location.